Ask permission from a parent or teacher before visiting this or any website in the internet. Do not click on any links or ads unless you have permission. Never give out personal information online. If not sure ask and be a responsible digital citizen! 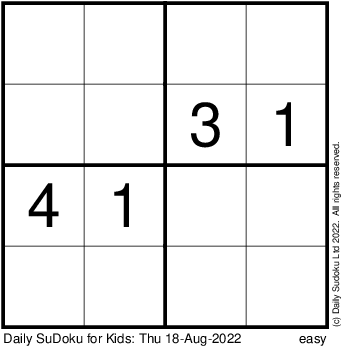 Visit www.dailysudoku.com for more puzzles, solutions, hints, books and other resources.